As a bachelor, I frequently eat food out of the pot or casserole dish it was cooked in to reduce the amount of work involved in cleaning up afterwards. It may sound lazy but honestly, most innovations are designed to make our lives easier, so why get hung up on doing things that are unnecessary? 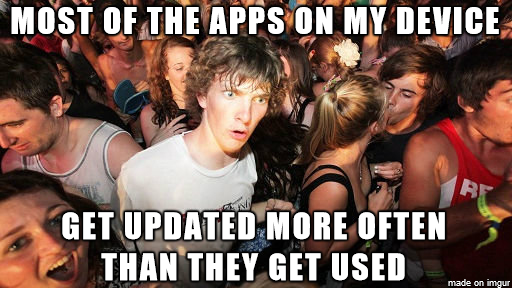 Now that I've realized how much time and effort is going into applying updates relative to how much benefit I'm getting out of those apps, I think maybe I should be applying the same philosophy to keeping apps that I do to using dishes. Reduce as much as possible.